Color/Pattern: This attributes type different than the other two. 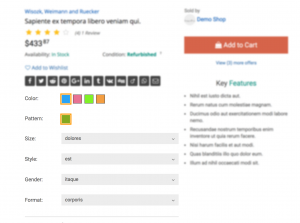 You can set a color/pattern image as attribute value and the color/pattern image will be shown as options on the product page instead of the attribute name. The pattern image should be a tiny sample of the item patterns. Radio: The radio attributes type is simple and a dropdown box will be shown as options on the product page. Select: The select attribute’s type is the same as radio type and a dropdown box will be shown as options on the product page.